When the world considers bulk electricity storage big batteries get the attention, but pumped hydropower does most of the work. A world dependent on wind and the Sun will need much more of it, something renewable energy skeptics argue will be prevented by a lack of suitable locations. An atlas of 530,000 potential sites challenges that, even though the authors acknowledge some won’t stand up on closer inspection. The principle of pumped hydropower is elegantly simple. When electricity is plentiful, water is pumped from a low-lying reservoir to one several hundred meters higher. When demand exceeds supply, the same water is allowed to run back down, spinning turbines like the traditional hydro-power stations that supply a sixth of the world’s electricity. Naturally the process isn’t 100 percent efficient, and indeed wastage is usually higher than in lithium-ion batteries, but the low cost of construction more than balances that out. “One medium-sized pumped hydro site stores more energy than all the batteries currently in the world, including car batteries,” Professor Andrew Blakers of the Australian National University told IFLScience. Blakers added that batteries are excellent for storing a lot of power for brief spikes in demand but noted that despite the recent precipitous fall in their prices, they still cost five to six times as much for long-term storage as pumped hydro. However, while batteries can be installed anywhere, pumped hydro depends on location. Facilities have been constructed in old mines, but most rely on sufficiently steep hills to be able to place reservoirs close together and have sufficient altitude between. In 2017 Blakers and colleagues used satellite imagery and algorithms they described in an Applied Energy paper to identify 22,000 Australian sites with the right topography. Now they have expanded this to the world, releasing maps of the locations they have identified. Each site is suited to storing at least 2 gigawatt hours, enough to last a small city through a windless night. Collectively, these sites could store 22 million gigawatt hours. 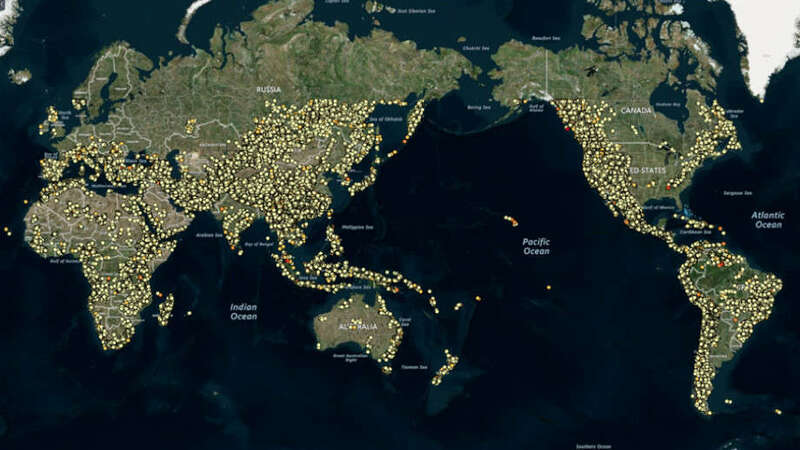 “Only a small fraction of the 530,000 potential sites we’ve identified would be needed to support a 100 percent renewable global electricity system,” first author Dr Matthew Stocks said in a statement. Urban areas and national parks have been excluded. Blakers dismisses the idea many sites lack sufficient water, noting the water is recycled endlessly. He added floats that suppress evaporation can ensure even desert sites will refill with rain quicker than the water escapes. The authors do acknowledge some sites will fail on closer inspection, either because their environmental or heritage value is too high to flood, or porous rocks will soak up the water. However, Blakers said, even flat and densely populated Europe has many times more sites than it will ever need, so the best ones can be chosen.